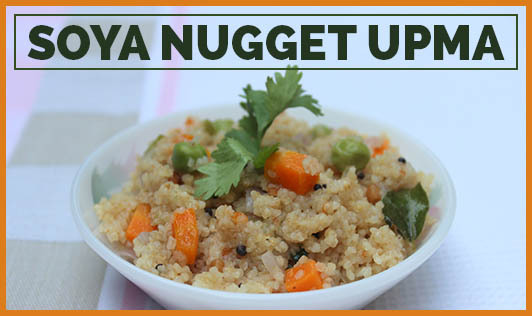 This dish is rich in iron, folic acid, and vitamin B12, and is far more nutritious than the regular upma. It also provides plenty of vital nutrients like protein, energy, and calcium and is an excellent option for mothers to be, especially during the first trimester. • Boil 2 cups of water in a vessel and soak the soya granules in the hot water for about 15 minutes. • Drain and squeeze all the water out of the soya and keep aside. • Heat 1 tbsp of oil in a nonstick pan, splutter the urad dal and sauté until the dal turns light brown in color. • Add the ginger and green chili paste and chopped onions, and sauté until the onions turn light brown in color. • Add the carrots and sauté for 2 to 3 minutes. • Now add the soya granules, salt, and lemon juice. • Stir well and cook for another 2 to 3 minutes with intermittent stirring in between. • Garnish with coriander and serve hot. Enjoy this delicious recipe and keep your health well along with your baby's too!